Solar Swimmin' Pool: Start Here! VW Bus Bed Build: Start Here! Monster Tub Build: Start Here! 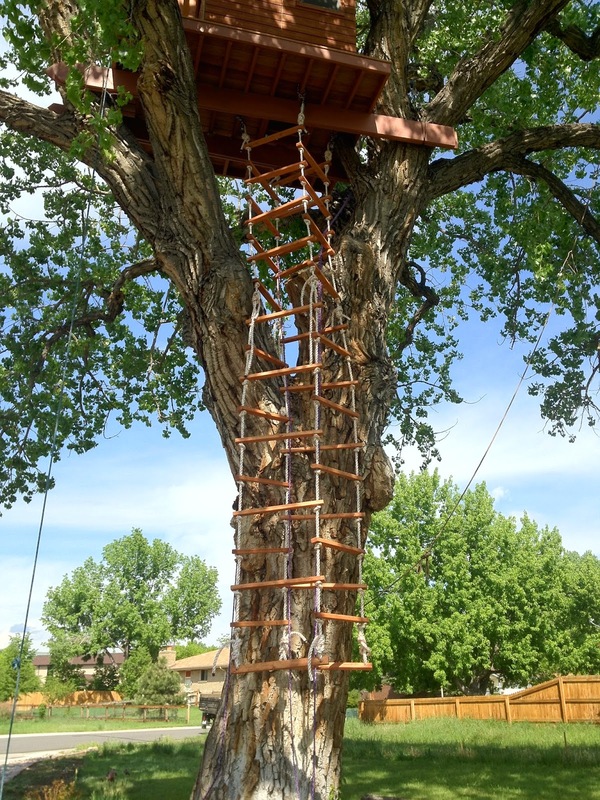 What I thought would be a relatively easy part of the treehouse construction project turned into a pretty large amount of work; getting the treehouse rope ladder sections I'd tied properly connected and level took more time and effort than I figured. First, the sections are pretty heavy. Since my safety line went up the west side of the tree, I thought I’d hang the ladder there and see how it shook out. Kind of poorly, as it turned out. It became obvious it needed to hang on the east side of the tree. 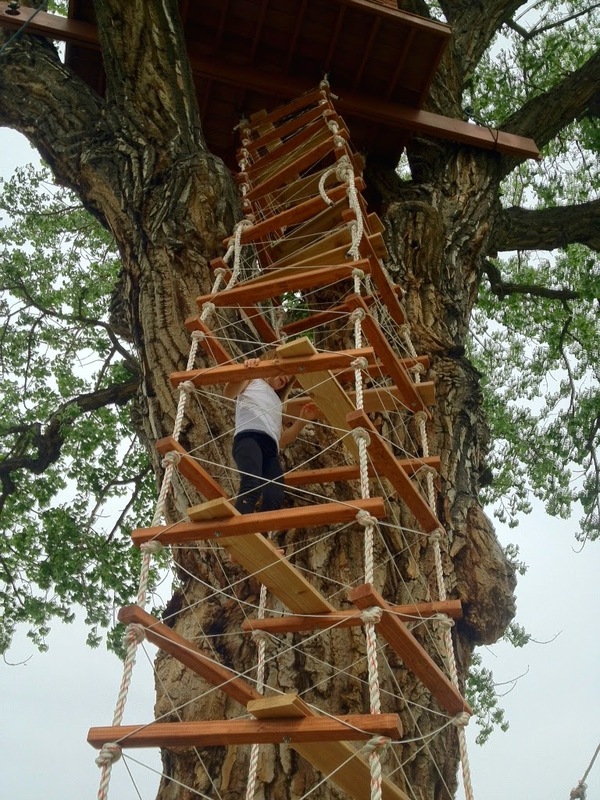 Once the ladder settled a bit, I started going up and down it with a cinch strap. I’d connect the strap to ladder rungs on either side of a knot I wanted to move, taking up the tension with the strap so the knot could be untied. I’d move the knot until I figured it was level, let the rung in question back down to rest on it, then undo the cinch strap and look to the next one. My workplace for the better part of a day. It took a lot of fiddling, but eventually it started to look more or less level. 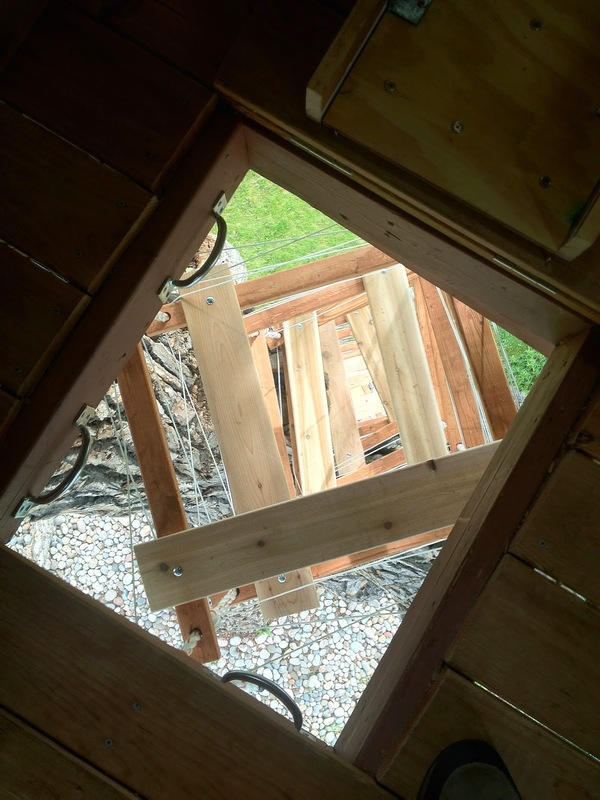 Next I drilled holes in a few strategically-chosen rungs, and bolted opposing planks to them to make things easier on little climbers. This had the added benefit of stiffening things up a bit. The best part of adding the planks is easiest seen from the top. 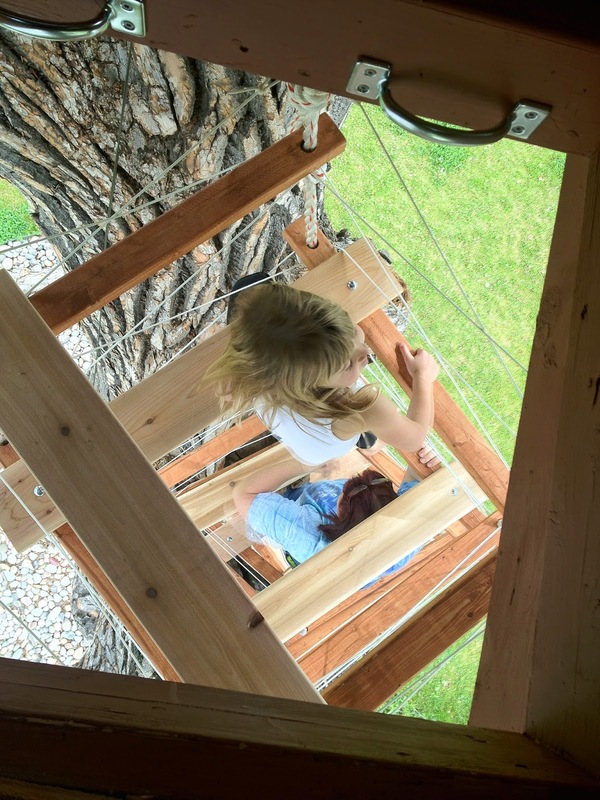 If you notice, there’s not much chance of someone losing their grip and falling particularly far, much less all the way to the ground down the middle of the treehouse rope ladder. I was super pleased. Note the prototype trap door and additional grab handles. You can also see in these photos I’d weaved a few hundred feet of parachute cord into an X-shaped pattern on all four sides, as a temporary measure until the netting I'd ordered arrived. This was mostly to reinforce the boundaries of the rope ladder in the minds of climbers, but it also added some tension and made the ladder feel more stable. I needn’t have worried, however; the weight of the thing -- and it's proximity to the trunk -- keeps it almost motionless as you climb, once you’re past the first few feet. This was as long as I could keep my daughter (and wife) out of the treehouse. Up they came. The extra planks actually make it a little harder for grownups. We'll survive. 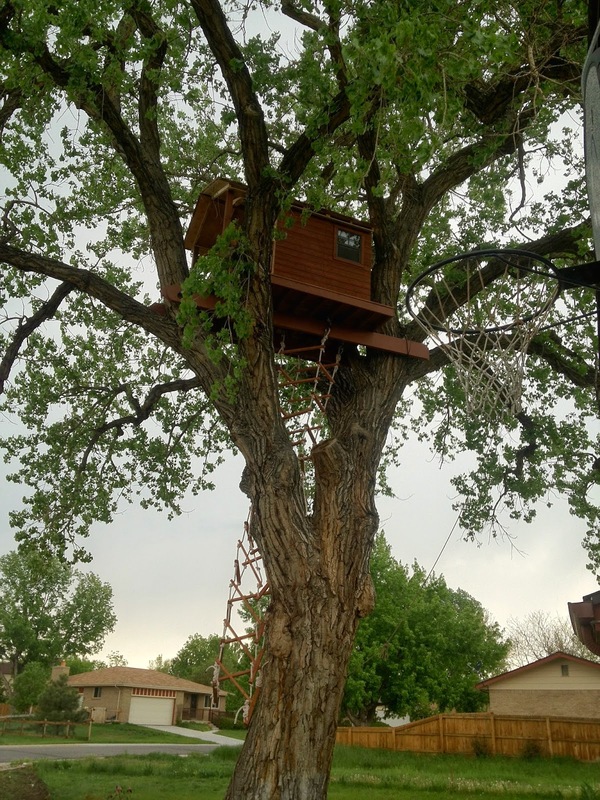 The consensus was that it was the greatest treehouse ever in the history of tree houses and greatness. 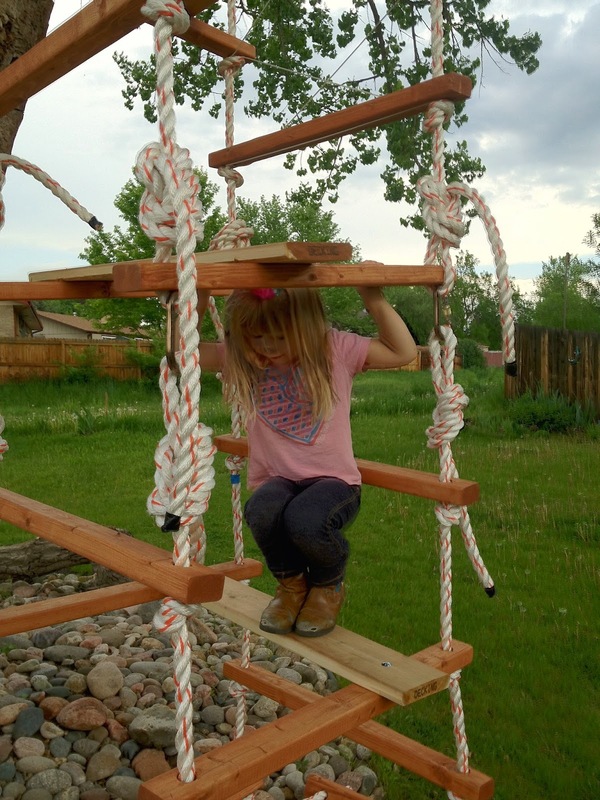 Next we’d put the finishing touches on the rope ladder, and decorate! 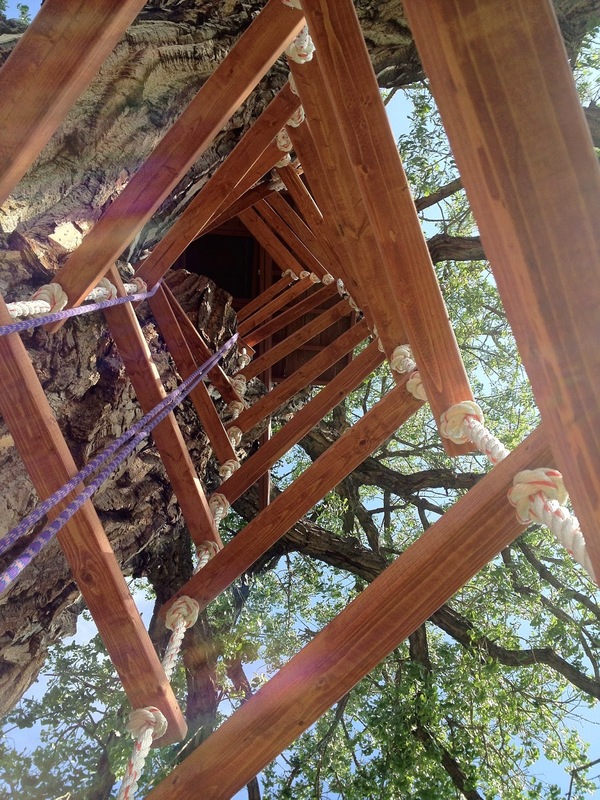 Part 9: The Second Treehouse Beam, and Video!